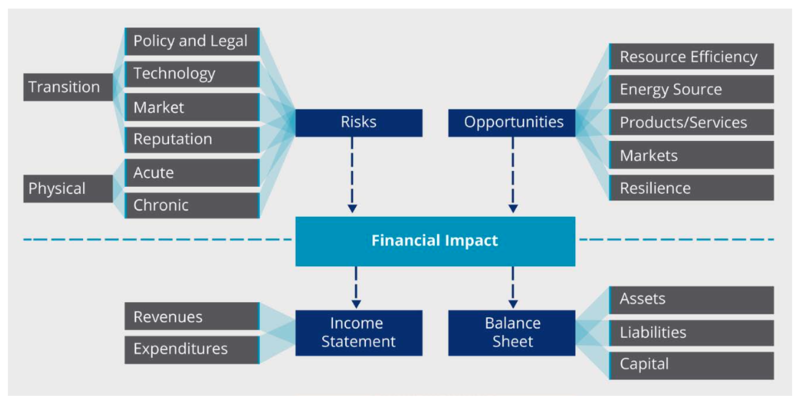 Climate Related Financial Disclosures – The Way Forward? Member of the Climate Change Working Group, Wayne Kenafacke discusses the recent recommendations report from the G20’s Financial Stability Board’s Task Force on Climate-related Financial Disclosures. Climate change can no longer be thought of as a “future issue” by Australian Financial Institutions. Not after APRA Executive Board Member Geoff Summerhayes’ speech to the Insurance Council of Australia’s Annual Forum on 17 February. Mr Summerhayes used this speech to make clear that APRA views climate change as a current issue, because the transition risks arising from policy, legal and business changes necessary in order to meet commitments under the Paris Climate Agreement are already being experienced. Transition risks are particularly relevant. Firstly, in order to mitigate future physical and direct risks of climate change (e.g. rising sea levels), governments are committing to taking action and facing the consequent transition risks now and in the short-term. Secondly, you don’t even need to trust the climate science to acknowledge climate change transition risks, as these transition risks arise from society’s response to climate change, so even climate change skeptics fear their impact. Any effort to meet the commitments under the Paris Climate Agreement or similar carbon reduction targets, creates transition risks associated with those actions. 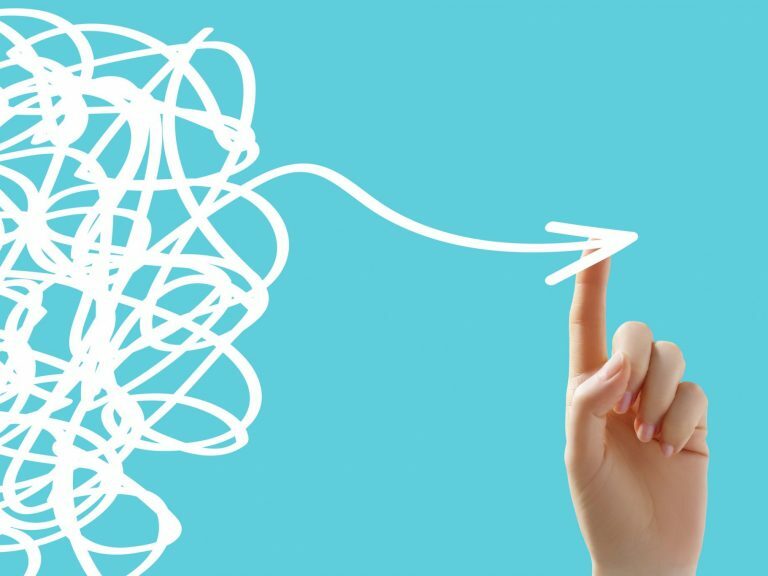 We’ve all heard the phrase “What gets measured gets managed” and identification, measurement and monitoring of risks are key parts of any risk management framework. So how should an organisation measure and manage its exposure to climate change risks? A key and recent development is the release by the G20’s Financial Stability Board of the Recommendations of the Task Force on Climate-related Financial Disclosures (FSB TCFD). 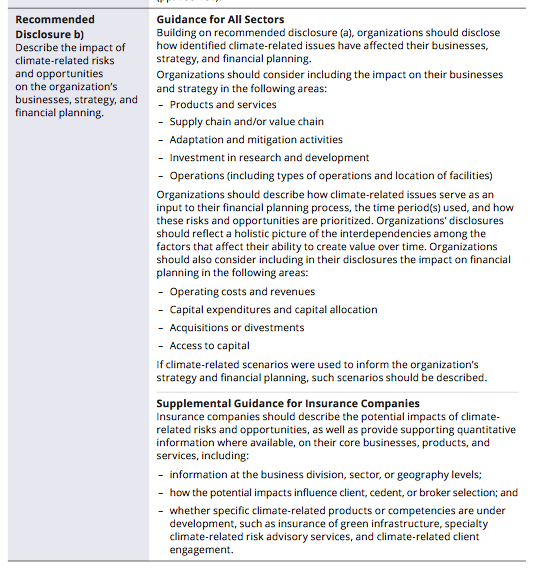 The aim of the report is to provide a “clear, efficient, and voluntary disclosure framework that improves both the ease of producing and using climate-related financial disclosures.” Developing a framework for external disclosure reflects the importance of managing the business implications of climate change to external parties such as investors, creditors and regulators. The framework is intended to apply to any organisation in any country and any industry, voluntarily as part of financial filings and disclosures. It consists of both generic guidance and detailed guidance for organisations in specific industries likely to be most impacted by climate change, including insurers, banks and asset managers. 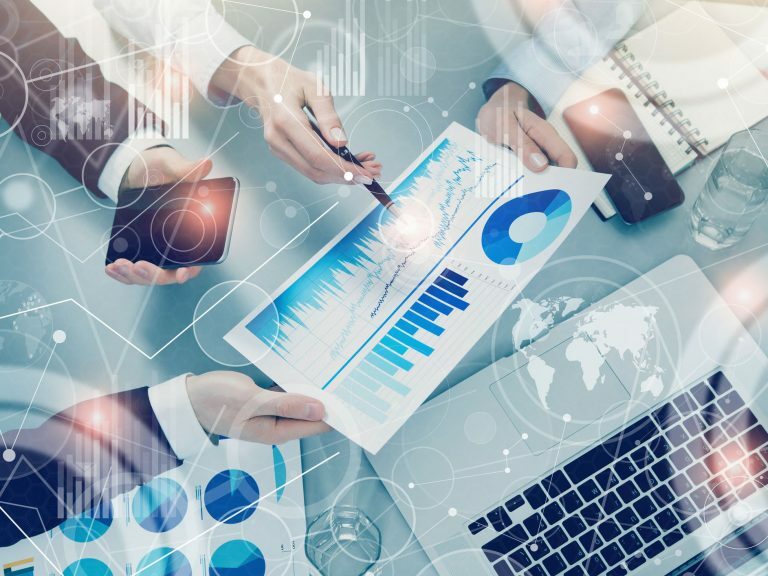 While initially the disclosures are likely to be mostly qualitative in nature, the FSB TCFD intends to include more quantitative measures over time. 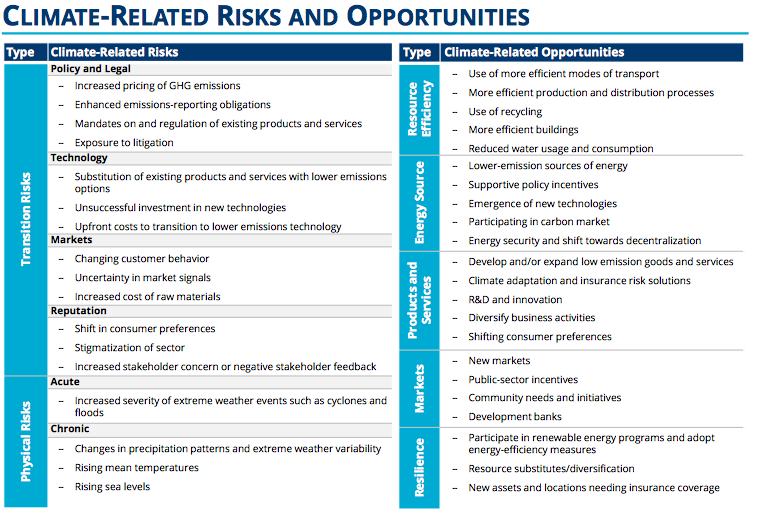 Initially the report outlines a framework for identifying climate related risks and opportunities, as illustrated in figures one and two. 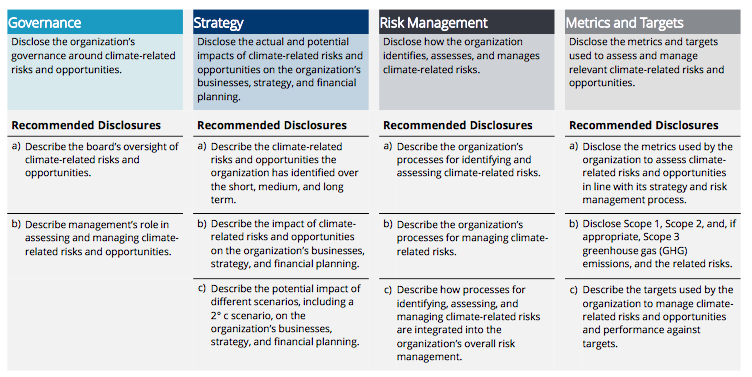 After using this framework to identify the climate related risks and opportunities specific to an organisation, the report recommends specific disclosures grouped into categories relating to governance, strategy, risk management and metrics and targets, as illustrated in Figure three. The segmenting of disclosures across these categories should provide users with insight into how an organisation is considering and approaching climate related issues, in addition to providing an estimate of the organisation’s actual exposure. Figure four provides an example of the detail supporting a recommended strategy disclosure, including both the generic guidance and supplemental guidance for insurance companies. 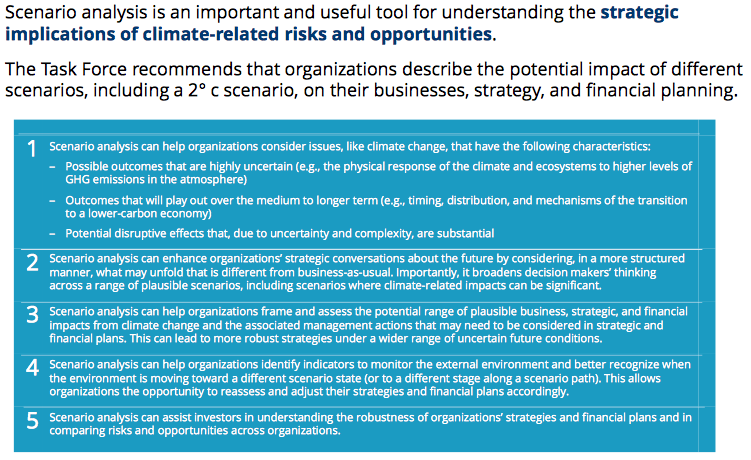 Given the vastly uncertain range of potential outcomes, the report emphasises the importance of scenario analysis as a tool to assist organisations to consider climate risks and opportunities (see Figure five). The IAA supported the intention to include more quantitative measures over time and proposed a detailed review of the standards every three years, with a focus on the balance of quantitative vs qualitative disclosures. The IAA also suggested that the use of multiple standardised scenarios in disclosures may be more informative than the use of a single scenario and also noted the potential for impacts to be asymmetric (e.g. around tipping points like whether or not permafrosts thaw) and suggested the use of scenarios that are both more optimistic and more pessimistic than a two degree C scenario. A final standard is scheduled to be released in June this year. The use of climate related financial disclosures could be a key element in helping organisations to understand, prioritise and monitor their response to both the physical and transition risks arising from climate change. Accordingly, the development of a standardised framework and guidance for such disclosures, is to be applauded. Intended to allow broad adoption and also to allow the disclosures to evolve over time, the guidance may lack the level of detail that is necessary to ensure comparability and consistent application. Given this need to provide sufficient guidance while also allowing the disclosures to evolve, the IAA proposal for a detailed review of the standards every three years is particularly helpful. Probably the greatest benefit to many organisations from adopting the disclosures would be the value of the insights gained by applying the framework illustrated in figures one and two. In doing so, organisations can readily gain an understanding of the unique risks and opportunities facing that organisation arising from climate change. The Institute’s Climate Change Working Group will continue to monitor the development of the FSB TCFD standards. Wayne is an experienced and commercially focused financial services executive and in recent years has held executive roles as a CFO, GM Products and Chief Actuary. His experience spans many segments including life insurance, superannuation, financial advice, general insurance and retail banking. He is a member of the Institute’s Climate Change Working Group.